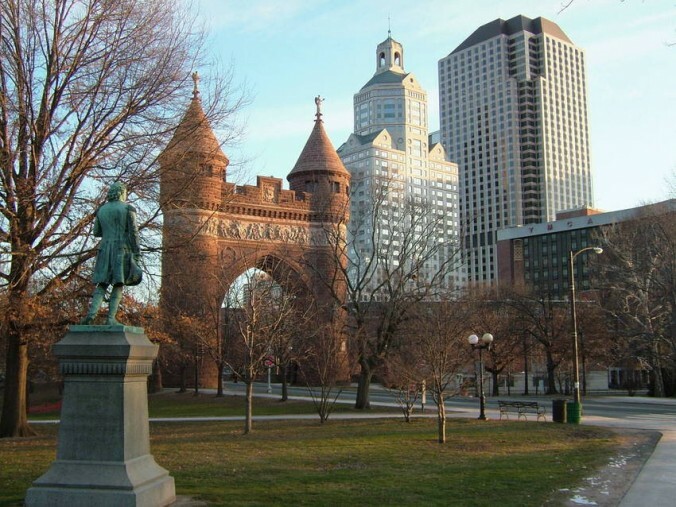 The sixth state to enter the union was Massachusetts. While Massachusetts has been a state since February 6, 1788, its state flag was not adopted until 1971. Before then, the flag had a design on it that was on both sides of the flag, which was later omitted. The current design features a Native American holding a long bow against a blue shield. The white star inside the shield represents the state of Massachusetts. The state motto is written on a blue ribbon in a yellow color that reads in Latin, Ense Petit Placidam Sub Libertate Quietem which means “By the sword we seek peace, but peace only under liberty.” And on top of the blue shield and the Native American is an arm wielding a sword. Several U.S. Presidents were born in this state. John Adams (2nd President, from 1797 to 1801) and John Quincy Adams (6th US President, from 1825 to 1829) were both born in what was then known as Braintree but has since been renamed Quincy. Following the Adams’ is John Fitzgerald Kennedy (aka JFK), born in Brookline in 1911. He served as the 35th President from 1961 to 1963. Lastly is George Herbert Walker Bush, the father of Former President George Walker Bush (2001 to 2009), the 41st U.S. President from 1989 to 1993. This state is also home to Plymouth Rock, a significant place in American History. This was where the Mayflower pilgrims landed in 1620. Located in Plymouth, Massachusetts, this little rock is inside Pilgrim Memorial State Park where over a million people, tourists and locals alike, come to visit each year. Entry into this park is free to the public. Folklore: Johnny Appleseed is the state folk hero and was recognized officially by the state in 1996. His real name was John Chapman, and he planted apple trees from New England all the way to the Ohio River. 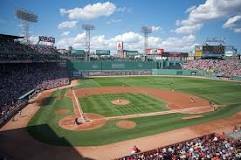 Sports: Fenway Park is where you can go and catch a baseball g ame. It is the home of the Boston Red Sox. Fans also come to this stadium to enjoy one of their famous hot dogs called the Fenway Frank. Just one week after Georgia was admitted into the Union, Connecticut became the fifth state to enter on January 9, 1788. Their state flag was adopted in 1897. On their state flag is a shield depicting three grapevines . These grapevines represent early English settlers in the state. Underneath the shield is a ribbon, written in Latin Qui Transtulit Sustinet, or He Who Transplanted Still Sustains, in English. This phrase is the state motto. Unlike many of the previous states, Connecticut is not named after a person. This state is actually named after the Connecticut River, which that was named Quinnehtukqut by the Mohegans in the Algonquian language. This river was used by the Native Americans for many years who lived in the area. The state’s capital is Hartford. A few historical events in Hartford include the first FM station to broadcast and The Boys and Girls Club which was founded in 1860. The city is only 18 square miles and houses 125,000 residents. Connecticut ranks the 48th largest state with just 5,544 square miles and 8 counties. Presidential History: 43rd US President George W. Bush (2001-2009) was born in New Haven on July 6, 1946. This state also has a Thames River, but not to be confused with the one in England! One of the major industries in Connecticut is actually insurance with many insurance companies being founded. Because of this, Connecticut is known as the Insurance Capital of the World! Georgia is the fourth state into the union. It became a state on January 2, 1788, right after the new year. Georgia is known as the Peach State due to a large amount of peaches that grow there (peaches became the official state fruit in 1995). In my research, I learned that Georgia originally had a different state flag. Several versions, to be exact, but the most well-known version is the 1956-2001 flag. The first flag consisted of the Confederate flag along with a blue background with the Great Seal of the State of Georgia. However, after flying for 45 years, the Georgia state flag was changed. The Confederate flag on the first state flag was controversial, reminding the people of Georgia of their darker days in history. The request to change the flag dates as far back as the 1980s. The request was to return to the pre-1956 design which was much like the then-current flag but with three stripes: two red, and one white. The bill for a new flag was finally passed in January 2001. The new flag that would be flown over Georgia was designed by Cecil Alexander, an Atlanta based architect. The new flag consisted of a blue background along with the seal of the State of Georgia in a gold color. Around the seal are 13 white stars to represent the original 13 colonies. Underneath is a gold ribbon labeled “Georgia’s History” with five flags. The first flag is the original stars and stripes with just thirteen stars, next is one of the coat of arms designs. Then comes the 1920s flag, followed by the 1956-2001 flag, and a 2001-2003 version. Last but not least is the current flag of Georgia. This 2001 incarnation of the state flag flew for just two years until 2003. While some were pleased with the new design, others were still not satisfied. Some felt it was an insult to their history and heritage. Finally, in May 2003, Governor Sonny Perdue signed House Bill No. 380 into law. The 2003 flag is reminiscent of the flag from the 1920s but the lower red stripe is longer and the blue is a little cut back as a result. This flag has finally won the favor of the people of Georgia. Travel: Although Georgia is a coastal state, there are two islands to which you can actually drive: Tybee Island and Jekyll Island. In addition to peaches, peanuts are also grown in this state.